Emile Hirsch is most often associated with bold biopics like Sean Penn's Academy Award-nominated Into the Wild, Gus Van Sant's Academy Award-winning Milk, and to a lesser degree Catherine Hardwicke's Lords of Dogtown (we'll be kind and ignore Speed Racer all together). But this year Hirsch has shown he has a distinct gift for comedy with David Gordon Green's bittersweet and offbeat narrative Prince Avalanche. You can get a taste of Hirsch and co-star Paul Rudd in action with the film's latest trailer, which you can see in hi-res at Apple. Over the past few years, Green has blown up, moving from quirky indie films (George Washington, All The Real Girls) to big flashy laffers starring the likes of Seth Rogen (Pineapple Express), Jonah Hill (The Sitter), James Franco and Danny McBride (Your Highness). But with these last two lackluster releases, Green's popularity and prospects seemed at risk. Notably, he didn't write any of his bigger comedies, and returning to scriptwriting seems to have made a major turn in Prince Avalanche. The movie has been receiving praise from Sundance to the Berlin International Film Festival and the Tribeca Film Festival, where this blogger had a chance to enjoy its charming blend of whimsy and earnestness. 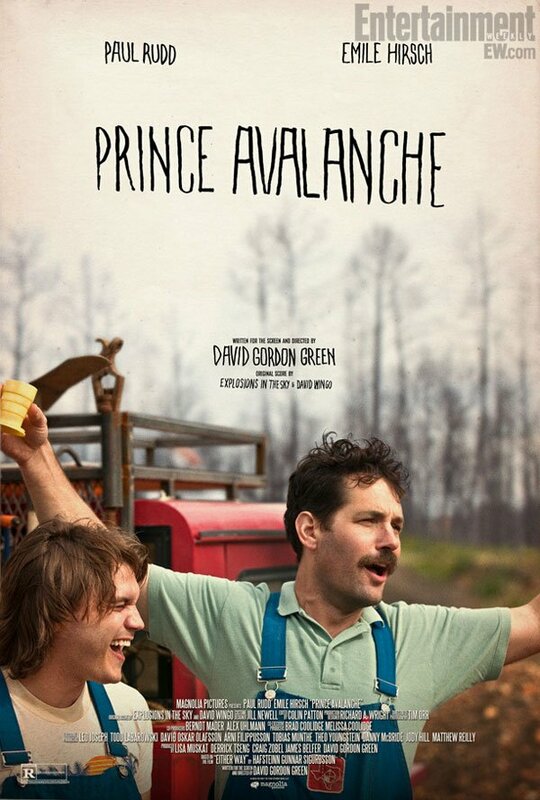 Based on the little-known Icelandic comedy Either Way, Prince Avalanche stars Rudd and Hirsch as Alvin and Lance, two road workers hired to paint lines and put up signs along a very long stretch of road in Texas that has recently been devastated by ravenous forest fires. Around them is desolation, which means isolation and boredom. For Alvin (Rudd), this is an opportunity to learn German via audio tapes and meditate on how to fix his wounded relationship with Lance's sister. For Lance, it's a chance to make some money, get to know Alvin, and maybe learn a worthwhile skill The two share a tent and spend all day within feet of each other, and soon this forced camaraderie results in resentment and fiery fights, which are wonderfully funny. Magnolia Pictures will release Prince Avalanche in theaters and on iTunes on August 9th.